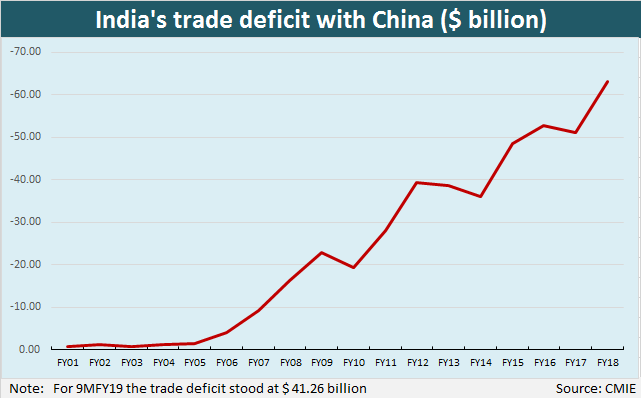 The accompanying chart shows how India’s trade deficit with China has gone up by leaps and bounds. The deficit went up from less than a billion dollars in 2001 to a massive $63 billion in 2017-18. Between 2013-14 and 2017-18, the deficit went up almost 75 percent. Imports from China accounted for around three percent of total imports in 2000-01, but it expanded to 16.4 percent of total imports in 2017-18. In FY18, China accounted for 39 percent of our overall trade deficit. The government has taken some steps such as imposing anti-dumping duties and talking with the Chinese government to increase our exports. These measures have helped a bit and India’s trade deficit with China in the first nine months of the current fiscal has been slightly lower at $41 billion, as the chart shows. The problem is not just China — the question is: why have our non-POL (petroleum, oil and lubricants) merchandise exports fallen from 14.4 percent of GDP in the September 2011 quarter to 10.2 percent of GDP in the December 2018 quarter? It’s a clear indication of the lack of competitiveness of much of Indian industry.